J Dawgs Special Sauce for Hot Dogs - So Festive! Ready to learn how to make the best tasting hot dogs? It’s bold to say, but once you try this hot dog special sauce, you’ll never go back. Once upon a time, there was this hot dog stand in the heart of Provo, Utah where I went to college. (Go BYU!) It was called J Dawgs, but to be honest, I didn’t really care since I hated hot dogs! Yep! Even though I grew up camping for weeks on end, the night we had hot dogs was rough. Ever single year. I’d fill my plate with chips and fruit. And hope for a better dinner the next day. Special Sauce For The Win! So what made these so darn good? You know what they say… the secret is in the sauce. And it’s completely true. The hot dog special sauce they serve with the 100% beef hot dogs topped with onions and pickles is to die for. Before you get to the sauce thought, you need to know how to cook them the amazing way. Because the sauce wont’ do you any good unless you have them cooked to perfection. Are you a fan of boiled hot dogs? Ya, me neither. A huge reason for me not loving hot dogs growing up was that seemed too mushy! That all changed when I bit into a J Dawgs and the insides were NOT mushy. Enter the hallelujah choir! What’s the secret to non-mushy hot dogs? The secret (besides the sauce) is a criss-cross cut that practically doubles the surface area of the hot dog that gets grilled. If you are lazy like me, you can grab this SLOT DOG criss-cross cutter that does all cutting for you! We have one and LOVE IT! It seriously takes hot dogs to the next level. 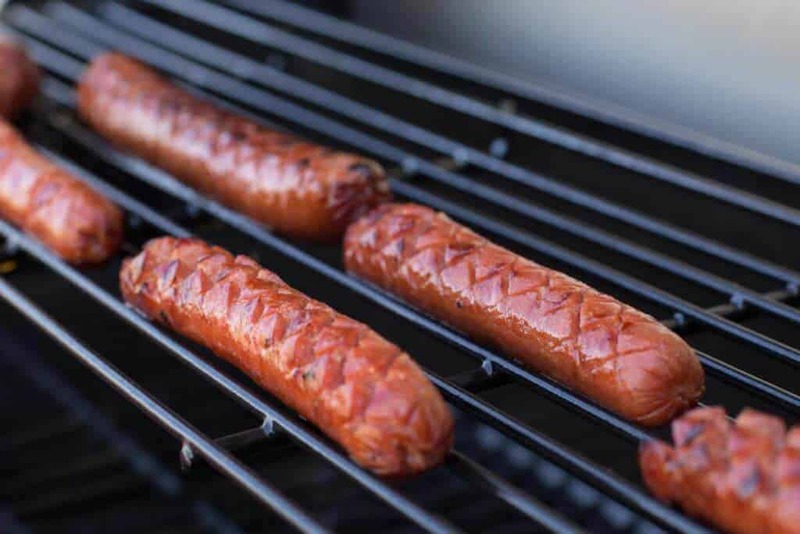 You’ll be able to have all your hot dogs cut and ready to grill in a few minutes. Throw your hot dogs on the grill or if you don’t have an outdoor grill, use an indoor electric grill. If you don’t have a slot dog, you can still get the criss-cross pattern. You’ll just have to create it yourself. This will take you more time, but you can still get similar results. You’ll take your hot dog and do a criss-cross cut part way through the hot dog. Does that make sense? Place the dog on a cutting board. Take a sharp knife and start on one end and cut diagonal cuts all the way down. And then start cutting the other direction. Spread open the hot dog and place on grill or on the campfire. You have no idea how happy I was when we came across a copycat recipe for their “Special Sauce”. I haven’t tried the sauces side-by-side, but as far as I’m concerned, it’s just as good as the real deal. Now I can create a “J Dawg” anytime I please. We make a big batch of this special sauce, keep it in a condiment bottle and store in the fridge. It stays good for a long time, so this sauce is always ready when we need it. If you’re planning a camping trip, add this to your camping menu. You can see all our favorite camping foods here. Tip: Make a double batch of the special sauce and take it camping with you! Or to a pot luck! Or keep it in the fridge with all your other favorite condiments. Cut the hot dogs in a criss-cross pattern using this Slot Dog hot dog cutter or hand cut. Make a big batch of Hot Dog Special Sauce (recipe below.) You can store it in a condiment bottle or pick one up at a kitchen supply store. Grill at home or cook on a campfire. Thank you for this recipe! We just had some homemade J-dawgs at a neighbor’s house this past weekend here in good ol’ Utah. I had never had them before and was surprised at how delicious they tasted. I can’t wait to make them myself. I’m so glad you loved them! They are so tasty right? This sauce takes hot dogs to an entire new level!! Perfect for camping trips and summer BBQs!